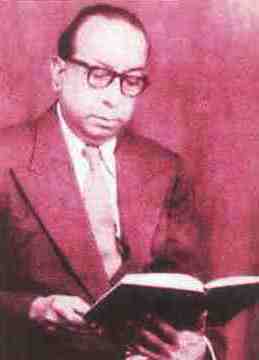 Sisir Kumar Mitra was an Indian physicist. He is the doyen of radio science in India. He is known for his seminal work on ionosphere. The ionosphere, which extends from about 60 km to several thousand kilometers high in the atmosphere, plays a major role in long distance radio communications. The air in the ionosphere is ionized. Sisir Kumar Mitra was born at Konnagar, a suburb of Calcutta, on 24 October 1890. He was the third son of Joy Krishna Mitra & Sarat Kumari. His father was a school teacher and mother was a doctor in Lady Dufferin Hospital at Bhagalpur in Bihar. Sisir Mitra first went to school in Bhagalpur district and there showed a serious interest in scientific studies. A few years later his two elder brothers died and his father became paralysed, and he would have had to leave school, had it not been for the insistence of his mother, an outstanding woman, that he should continue his education while she supported the family on her earnings from the hospital. After leaving school he admitted to the T.N.J. College, Bhagalpur, and from there in 1908 to Presindency College, Calcutta, where in 1912 he headed the list of successful candidates for the M.Sc. degree in physics.